Deacon Dr. Fresh Wine Newsletter: 1000 Best Wine Secrets - Reviewed by the Deacon! The Deacon Lubs Fat Cat! Zsabos correct again! Canada gets thumbs up! Happy New Year from The Deacon!!! The Deacon Interviews Brain-Girl Sara D'Amato! The Deacon's Male Bag, and More! 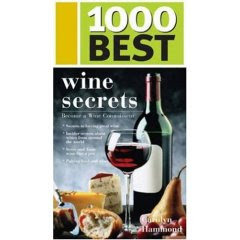 1000 Best Wine Secrets - Reviewed by the Deacon! Yo Homeys! How y'all doin? To all my genuine brothers and sisters, in the salty name of Calico Jack and by the weathered red horns of Angus Young's Gibson SG, I greet you! ...and yes, I ain't forgotten all you Tylenol 3 addicted, poodle walkin', jet-ski ridin', Dorian Gray faced, campfire singin', Winnebago drivin', Idol watchin', peak oil disbelievin', Zapatista crushin' DIX who just can't stay away, no matter what I say! So...here we go...Today we're doin' another Deacon book review. In the past, your Humble Deacon has written up the fine works of Tony Aspler, Billy Munnelly, etc., and today we're checkin' out the work of one of your Deacon's homegirls, Carolyn Hammond. This all came about a couple of weeks ago, when your Deacon was contacted by email and axed to review 1000 Best Wine Secrets. I naturally said I'll give it a look, and so when it arrived in the mail, I turned the sites of my Glock on this glossy volume, and the result is this article. The book starts off with a chapter on buying great wine. One of the first things you see is a cool chart of all the major grape varieties in the world. It's nice to be able to know what flavours particular grapes are generally accepted to taste like, once they're made into wine. For example, if you look up Nebbiolo, the grape responsible for the fine wines of Barolo, you see "rose and tar". The book states that the most popular grape varieties are in bold print. The only problem is...they're not. Obviously, someone forgot to make that critical step. So I put it down to editor or proofreader error. Whoever made that mistake should be forced to do penance and drink Blue Nun and Black Tower for a year, although they may be granted clemency after 9 months for good behaviour. Now back to the book...I actually enjoyed it a lot. I don't know if I'd call them "secrets" so much as "tips", as there's nothing here that's cloaked in dark Masonic ritual. The tips are really good though, and there really are a thousand of them. The book's nicely laid out too, in sections that make sense. There's info on buying wine, ordering in restaurants, pairing with food, and some really interesting and useful info on the various wine regions of the world. For instance tip 594 says that Northwestern Spain is for white wine lovers. Particularly good wines come from Albarino and Verdejo varieties, neither of which I'd heard of. Tip 893 warns that we're being told that Pinot Noir is going to be the next big thing out of New Zealand, but buy it with caution, as quality is still spotty. Tip 949 tells you to store your wine away from harsh chemical smells like paint which can taint the flavour of the wine (something a lot of you DIX who store your wine in the garage need to remember). This is a really good book for browsing, too. You don't have to read it cover to cover, like I did. You can use it as a ready reference, as the index is complete and very user-friendly. Best of all, you can just open it anywhere and grab a new piece of wine info to dazzle the morons in your family. Carolyn Hammond holds a diploma from the Wine and Spirit Edukashun Trust and really knows her stuff, so I say it's a good book to add to your wine library. Based on its content, appearance, general usefulness and laidback style, the Deacon rates 1000 Best Wine Secrets **** out of a possible 5 stars. You can order it from Amazon or Chapters online and have it in a few days. freaken hillarious shiat, fun wine stunts, delicious tours and so much more. great to see someone who loves VQA as much as us!